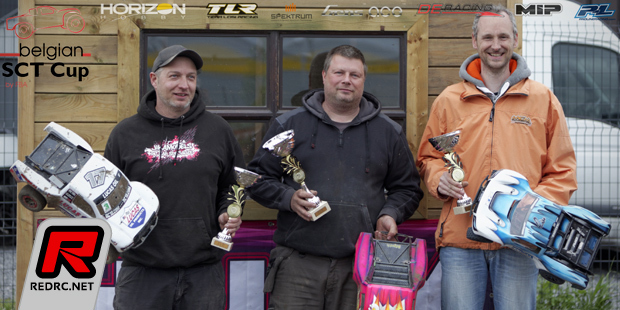 The 2nd round of the Belgian SCT Cup was run in Seraing, Belgium. The track layout with its few low-speed corners, elevation changes and nice jumps made for close racing while its surface dries very fast which was a plus over the weekend too. In Pro2 the race was on between Juian Andre (Team Associated), Philippe Hautecoeur (Team Associated) and Nicolas Evens (TLR 22SCT) who each took a leg in qualifying. Philippe and Julian where also tie on points but at the end Julian took TQ with a better time. In Pro4 Thierry Matthieu (Tekno) dominated qualifying like he did in Brussels. 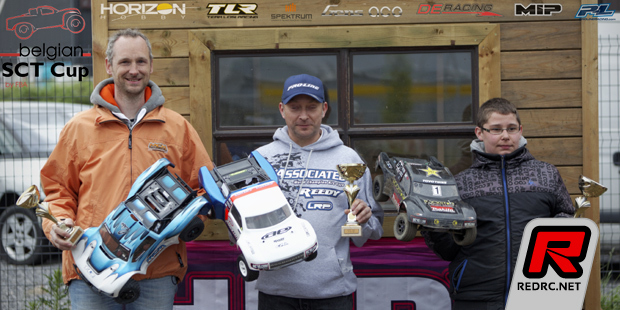 Nicolas Evens (TLR) followed in front of Jean-Yves Konings (Team Associated). Starting from the number 2 spot into the finals Philippe Hautecoeur secured the overall win by taking the first two A-main. In the opening leg Philippe came in with some margin in front of Julian Andre while in A2 he was in a close fight with Nicolas Evens. Julian then went on to take the win in A3 securing himself the runner-up spot. In Pro4, Thierry Mathieu was able to win A2 and A3 to get the overall win from Nicolas Evens, winner of the opening A-final. Jean-Yves followed in 3rd place in what was his first SC race this year.